Are you heading towards “freelancer burnout”? In the UK, the IPSE estimates that 78% of the UK public believe that freelancing helps to promote a good work/life balance. Whilst freelancing does offer flexibility and freedom, you and I both know that it’s not the easy option many of our friends and family think it is. 302,000 (or 15%) of all UK freelancers are mothers, a figure which has increased 79% since 2008. And if you’re a freelancing parent like me, you’re not only juggling the work you do for your clients, caring for your children and the day-to-day household chores. You’re also running your own business and doing everything that comes with it – accounts, admin, marketing, networking and more. When you’re your own boss, if you don’t learn to organise and prioritise your workload effectively, it’s no surprise that you’ll end up working more hours than you’d like with a to-do list that only ever seems to get longer. As a Virtual Assistant, I spend my days helping clients to implement proper processes that will set them up for success. 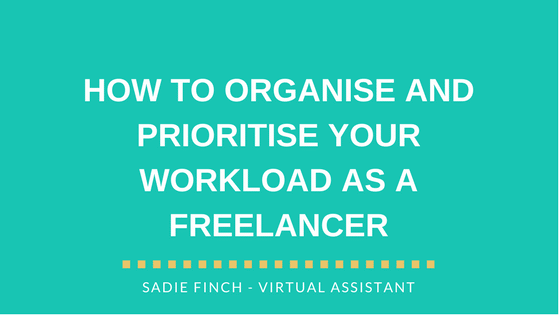 In this post, I’m sharing some of my best strategies that will help you organise and prioritise your workload effectively. Whilst this is a fairly obvious one, it’s surprising how many people fail to take advantage of an online calendar. I’ve worked with clients who use one to plan in their meetings and appointments only, whilst their ever-growing to-do list remains by the side of their keyboard on a scrap piece of paper. Try predicting the length of each task on your to-do list. Then block out time during the week when you’re going to tackle those tasks. Not only will this help you to develop a clearer plan of how you’re going to get everything done, but you’ll also start to recognise how long things take and how much work you can realistically handle within a week. The image below shows a basic example of how you can use an online calendar to organise and prioritise your workload. My top tips for making this work? A free project management tool (such as Trello or Asana) can help you manage the individual tasks within a project. Using a ‘board’ within Asana, you can display separate tasks under different lists and easily move them around to show when they’re complete or ready for the next step. You can invite other team members, such as clients or colleagues, add comments, files and set deadlines. It’s a very intuitive system that visual people will find especially helpful. This guide from Asana on how to use boards to help you organise and prioritise your workload will leave you raring to go. I always find that the best way to get started when you’re on a big organisation kick is to have a good old declutter. Tackle your workspace, your digital folders and your inbox. Clear everything out so that you’re ready to start again with a new and improved system. If you’re not sure where to start, I recently shared my best ideas for handling an inbox detox. If you’re just too busy to organise and prioritise your workload yourself, it could be a sign that you’re ready to outsource some of your tasks. I know how it feels to get bogged down with admin tasks. Things like setting up and maintaining a CRM system, keeping your accounts up to date and uploading new blog posts are all time-consuming tasks that demand our attention and yet don’t directly contribute to our earnings at the end of each month. By hiring a virtual assistant, you’ll be free to focus on driving your business forward and increasing your income, whilst an experienced professional handles the behind the scenes stuff that keeps your business ticking over.